The very first hostel i tried! Great location near to city center n very friendly staff always happy to help you. You also get to do all the awesome nightlife events new friends. But the real reason that I want to stay in this hostel are awesome stuff always friendly and happy to help!!!! Merci mes amis et gros bisous à vous!!!! 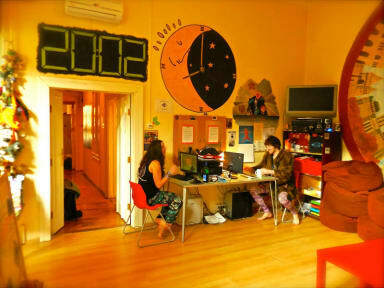 You need at least one week to stay at this hostel.Its a small one in a quiet building. So we started to playing drinking games at 7:30 every evening and went out at 8:30 together. The vibe here is very social . I doubted in the beginning that it might not be a place for me and it turned out no. I met cool people and became friends with them. In all, its perfect for meeting people and partying hard. cosy and comfortable, the staff are very helpful and they have fantastic vibes to make friend, so it's so friendly to those travellers who are alone.